Recently, China Citrus Watching Wuming · Wuming Citrus Listing in 2019 Press Conference and Channel Business Cooperation Fair was held in Beijing Xinfadi International Agricultural Product Exhibition Center, announcing that this year listing Wuming citrus will further open the Beijing market of Wuming citrus and continue to expand sales channels. 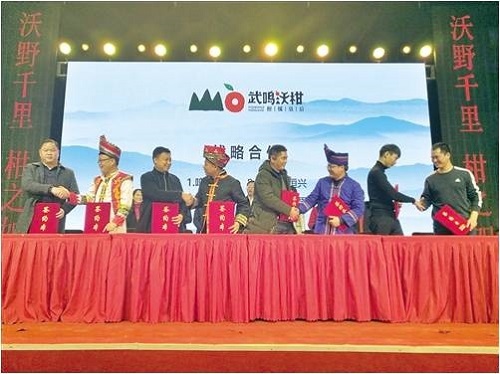 At this conference, Wuming citrus enterprises and Beijing purchasers talked face-to-face, had in-depth communication on citrus sales and other aspects, and signed strategic cooperation agreements on the spot. He Xiang, Standing Committee and Executive Vice-President of Wuming District Committee, said that at present, Wuming District is accelerating the implementation of the Rural Vitalization Strategy, devoting itself to shaping the “Wuming Citrus” regional public brand and improving the economic efficiency and market competitiveness of Wuming citrus industry. Next step, we will continue to guide and encourage enterprises to create brands. Through the construction of “Three Products and One Standard” and the creation of selenium-rich products, we will further enhance the brand influence of Wuming citrus, expand and strengthen the Wuming citrus industry, and form a number of national and autonomous region-level well-known brands.